This morning on the train I annoyed a commuter. I didn’t mean to, and I suspect his day had already started badly by the time he encountered me, but I annoyed him all the same. He was around sixty and wearing a mask, since the hay fever season has started. I am fortunate to not have to face the daily crushed commute, but when I do get on a rush hour train I like to listen to music to block out everything else. Armed with my trusty iPod I squeezed onto the train and turned on some music. He immediately fixed me with an icy stare and I quickly hit stop. He looked away, so I pressed play and his eyes swivelled back to me. Music off again, he looked away. I started to listen again, and this time waited a few seconds. He fixed me with a venomous, beady-eyed stare, he was definitely annoyed with me. I turned the music off and could hear him muttering, ‘urusai’, ‘noisy’ and not wishing to incur any more wrath I stood in silence for the rest of the journey. Now, I didn’t take out the ear buds, I was not going to surrender so easily, but as I stood music-less in the great crush of people, and looked at all the other commuters happily plugged into their smart phones and iPods I wondered what I had done to upset him so. Maybe I was the closest noisy person. Maybe I was more easily separated from the crowd because I’m not Japanese. Maybe he had bad hay fever this morning. Maybe he hates his job. Maybe he didn’t enjoy his weekend. Maybe he doesn’t like Monday mornings. I hope I didn’t spoil his whole day. Living in Japan it’s easy to forget how to roll with the more feisty approach to interaction I encounter in Europe. Here we are aiming for wa, harmony, and the education system inculcates this subjugation of the individual to the group. Students learn to work together, in club activities, for sports days and culture festivals. The individual who, for example, asserts his right to be hissy on a crowded train is not playing by the rules. His safety catch was off and I didn’t know what he might do next. Standing there wondering what on earth could be going on, listing all the possible stressors, I realised that there is a tiredness in the air. We have had a cold winter and we’re ready for spring. 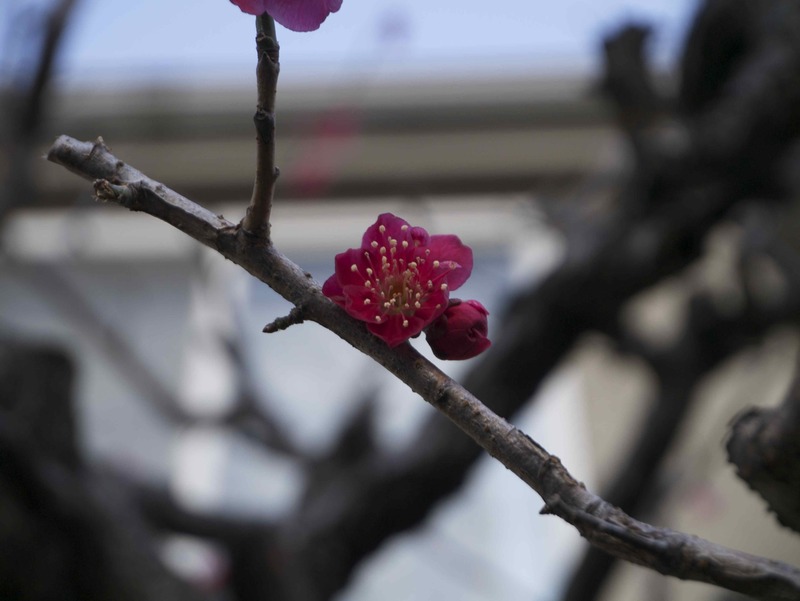 The plum blossoms are blooming, so are the early cherry blossoms, but it’s still cold. For students and teachers it’s almost the end of the school year, bringing tests and grading with it. Tree pollen is already in the air, starting with the most dreaded of all, Japanese cedar, planted widely after the war to counter deforestation and now widely responsible for the itchy misery of millions. Most of all, tomorrow is March 11th. The 3rd anniversary of the Great East Japan Earthquake, the M9 earthquake and the monster tsunami that devastated Tohoku. I wrote about this last year, and it is frustrating to write that there are still 267,000 people living in temporary housing. So how did I get from an irritated commuter to this? I have been thinking today about a quote from the writing of Lu Xun, a Chinese writer I studied at university. I have been trying to track down the piece where the quote occurs, but so far I’ve had no luck. I think it’s somewhere in Wild Grass or A Call to Arms. Are we taking care of each other? Do we see individuals in a crowd? Do we really listen to each other, really connect with each other? I am glad I annoyed my fellow commuter this morning, because it made me stand in silence and wonder about what was going on for him. Deprived of my music, the bubble I usually choose to put myself in I stood there and made a list in my head of what could possibly be upsetting him. How often do I do that? Squashed in the middle of the carriage I found myself in fact in a space to think, and it was such a gift. There is plenty of news in Japan to distract us from the ongoing challenges in Tohoku; the economy, a right-wing government rattling its sabres at South Korea and China over territorial disputes, various members of NHK’s board of governors making outrageous revisionist statements about Japan’s recent history. We can be squashed into a crowded news cycle and not remember what life is like for the people whose lives changed on March 11th, 2011. We need to make space, for ourselves and other people, even in a vast crowded city like Tokyo. We need to be gentle with each other every day, but as the clock ticks towards midnight and we get ready to mark another anniversary, we need to remember ourselves, three years ago. This evening the lights on Tokyo Tower have been spelling out ‘kizuna’ (絆), chosen as the kanji of the year in 2011 and meaning ‘bonds’. Three years ago there was a feeling that we were all together in the days following the earthquake. One of the most common questions we asked each other was, ‘Were you with other people?’, because I think we recognised that being alone made everything much harder to bear. ‘My heart is extraordinarily lonely.’ Is that how the people of Tohoku feel? This entry was posted in Great East Japan Earthquake and tagged 絆, Fukushima, Great East Japan Earthquake, ichi-go ichi-e, Japan, kizuna, Lu Xun, March 11th 2011, Senkaku, Takeshima, Tohoku, Tokyo, Tokyo Tower on March 11, 2014 by tokyopurplegirl. Yasukuni – what’s the problem? Last week, some of Japan’s leading politicians from both the ruling party and the opposition, visited Yasukuni Shrine (靖国神社) in Tokyo. Following the visits, there was a negative reaction from other countries in Asia. It’s the kind of story that rolls around every so often; the visit and then the objections. Why do some Japanese politicians visit Yasukuni? And why does it anger other countries in Asia? First of all, some background to what Yasukuni Shrine is. There are many Shinto shrines in Tokyo and throughout Japan; some are grand and imposing, many are neighbourhood shrines. The grandest of all in Tokyo is Meiji Jingu (明治神宮), but Yasukuni is also very big. It was built in 1869 under the Emperor Meiji, and is the principal place where the souls of those who died fighting for the emperor are enshrined, though there are others. Currently there are almost two and a half million souls enshrined there, and more are added every year. The majority of those enshrined are fallen soldiers, but also included are other categories of civilians including women and children; people caught in the crossfire in any way; conscripted to work in factories for the war effort and people interned in POW camps. Yasukuni is separate from the state and the priests there make the decision about who is enshrined there. One controversy which we hear about sometimes in Japan is connected to the conscripted workers who are enshrined there. The families of these workers in some cases do not want their ancestors enshrined there; some are not Japanese but Korean or Chinese. Despite requests that their ancestors’ souls (神) be removed, Yasukuni refuses to do so. The reason given is that all the souls are enshrined together and it’s impossible to separate them. The controversy which was re-played last week is because by visiting the shrine and paying their respects there, the politicians were in part paying their respects to a number of Class A war criminals, executed or imprisoned after the Tokyo War Crimes Trials. There is an underlying friction which South Korea and China react to; it reappears with every new textbook approved which doesn’t address Japan’s wartime behaviour to their satisfaction, with any action by the Japanese government which reminds their Asian neighbours of their past aggression, and with every official visit made by politicians to Yasukuni. The countries who were invaded during the 1930s and 1940s, who were on the receiving end of Japan’s militarism which only ended with Japan’s defeat in August 1945 feel, to put it bluntly, that Japan has form. Japan, for its part, maintains that in defeat it made reparations and there is nothing further to be answered to or done. I have been to Yasukuni a number of times. It’s a good place to view the cherry blossoms in the spring, though as I write that after all that is above it seems like a flimsy reason to go there. About fifteen years ago I visited the museum there, and it was an uncomfortable experience. I didn’t read every scrap of information there, so I can’t write with any authority about how much is condones Japan’s militarism. What has stuck with me is seeing the submarine version of a kamikaze plane. It was a chilling thing to see, to imagine how many young lives were ended under the water or in the air. I also walked past the entrance to Yasukuni quite often when I used to attend the Lutheran church in Iidabashi. Sunday is the day all the extreme right-wing hobbyists favour for their outings in their black trucks, riding round blaring military music and yelling their demands for the return of the northern islands (now part of Russia) among other things. I often saw a lot of military-garbed men standing around, and it was a menacing sight. Of course, every country has a right and a duty to honour the sacrifices made by previous generations, and just because Japan was defeated does not mean they have no right to do that. But it is also true that the Japanese military did some terrible things, and that these things are not always taught clearly to the generations that have followed is hurtful to the countries whose citizens and soldiers suffered and were killed. It is always a balancing act, and really, can anyone say that they were taught the dark side of their own country’s historical adventures? Being British, I know I can’t. But this is the place some politicians choose to visit. The Prime Minister had asked his cabinet members to refrain from visiting, yet two of them did last Thursday, just one day after the newly-elected leader of an opposition party (former Prime Minister Shinzo Abe) did the same. With Japan already embroiled in disputes with both China and South Korea over islands (Senkaku / Diaoyu with China and Takeshima / Dokdo with South Korea), these politicians visited knowing what the reactions would be. So predictable. So avoidable. Just because you have the right to do something, should you, if by doing it you further damage relations with your neighbours? Is it worth it? This entry was posted in News, Tokyo and tagged Diaoyu, Dokdo, Senkaku, Takeshima, Tokyo, Yasukuni Shrine on October 23, 2012 by tokyopurplegirl.